"Red-Tails in Love," the 1999 book by Marie Winn, chronicles the romances of raptor Pale Male and his female companion in an unlikely setting: a nest atop a building on Fifth Avenue off New York's Central Park. Westport has its own developing love story between two red-tails that met in an unlikely setting: rehab in neighboring Weston under the care of Dara Reid and volunteers of her Wildlife in Crisis non-profit organization, which cares for injured and orphaned wildlife. 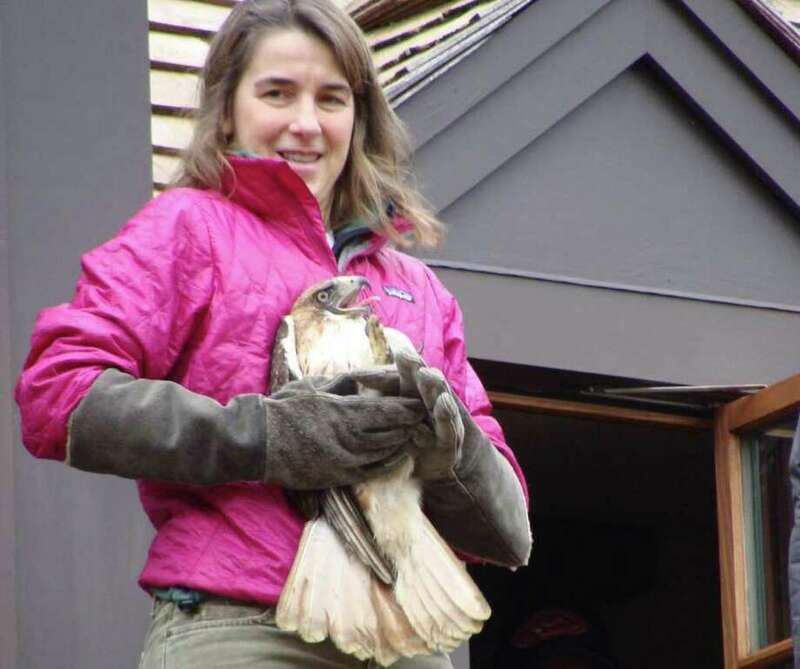 Reid and Ben Harrell, store director for the Westport outdoor clothing and equipment outfitter, Patagonia, released both hawks late Saturday afternoon from the balcony of a home off Evergreen Avenue near Winslow Park. Harrell's participation indirectly paid homage to Patagonia's founder, Yvon Chouinard, who, according to the company's website, "got his start as a climber in 1953 as a 14-year-old member of the Southern California Falconry Club, which trained hawks and falcons for hunting." The local hawk release was witnessed by about two dozen well-wishers, including the raptors' rescuers. The male and female hawks were both injured in separate incidents in the same general area days apart and were recuperating at Wildlife in Crisis when they bonded, prompting Reid and her team to decide to release them together in hopes they will become a mating pair. Peter D'Amico, a Westport special police officer, Animal Control Division, said the male got caught in a net near Evergreen Avenue last month and he brought it to Reid's rehab center. "I've brought up many species of wildlife to Wildlife in Crisis. I always do a follow up call to see how they're doing," said D'Amico, who rescued a swan that someone had shot with a pellet gun near Compo Mill Cove three weeks ago. The female hawk's condition was much more dire. Were it not for the actions of Dennis Quinn of Fairfield, she might not have lived through the night. Quinn's wife, voice teacher Beverly Lambert, learned from one of her students that a red-tail was sitting on an Evergreen Avenue property bleeding profusely from a wound of undetermined cause. "It was dripping blood. It was a goner. I would say it was hours away from death," said Quinn. He said the raptor did not resist his advances as he approached her with a large plastic tub to transport the hawk to Wildlife in Crisis, where Reid and her team of volunteers nursed her back to life. Quinn said seeing the hawk near death and then watching her soar into the sky was a remarkable experience. "I just won the Super Bowl of animal rescue. I'm going to Disney World," he joked. On a more serious note, Quinn said, "When I saw that one take off and keep going higher and higher and higher, it seems cliche but it really was life-changing and life-affirming to see something in nature like that and know that it was going to be dead if I didn't (intervene)," Quinn said. "There's nothing more awe inspiring than being part of a release of a healed wild animal," said Amy Jenner, a volunteer for Wildlife in Crisis, an all-volunteer group that will mark its 25th anniversary next year. Wildlife in Crisis volunteer Rachel Precious, 22, whose parents allowed the release to take place on their property, said she was grateful to have witnessed the event. "I saw them when they first came in and they were in miserable shape. It was great to see them go from the clinic to tossed into freedom. To watch them go from recovery from such poor shape to taking off is pretty rewarding," Precious said. Jenner said the organization averages about 5,000 animal rescues annually -- about 85 percent of which are releasable, and fields about 15,000 calls about injured wildlife each year. Jenner said rehabilitating an injured animal can be costly, and the organization relies solely on donations, which are tax deductible. Even the care of an injured songbird can cost $50. The expense for the hawks' rehab was about $100 each, but that's only because the birds did not have any bones or wing breaks, Reid said. Some animals can cost thousands of dollars to rehab, she said. "So much goes into caring for them between the injuries and feeding them and making sure they are suitable for release," Jenner said. All the while, volunteers must painstakingly implement care without letting an animal bond with humans because that would prevent their reintroduction to their natural habitat and impose on them a sentence of life in captivity for the remainder of their lives. Reid said the organization is coming up on its "busy baby season." The majority of the 5,000 animals they get generally arrive between May and September, she said. To make a donation to Wildlife in Crisis or learn about its programs to protect animals and their habitat visit the website, www.wildlifeincrisis.org, or send donations to Wildlife in Crisis Inc., P.O. Box 1246, Weston, CT 06883. Meg Barone is a freelance writer.